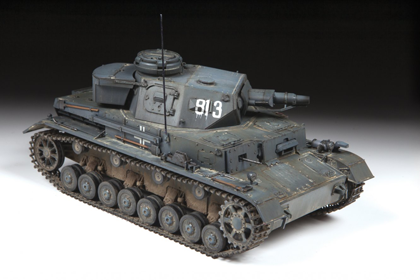 This is the Zvezda 3641 kit in 1/35 scale, of the ‘German Panserkampfwagen IV, Ausf. E’. The Panzer IV was the most widely manufactured German tank and the second-most widely manufactured German armored fighting vehicle of the Second World War, with some 8,500 built. The Panzer IV chassis was used as the base for many other fighting vehicles, including the Sturmgeschütz IV assault gun, Jagdpanzer IV tank destroyer, the Wirbelwind self-propelled anti-aircraft gun, and the Brummbär self-propelled gun. This entry was posted in Kits, Stash and tagged 1/35, 3641, german, medium tank, panzer iv, pz.kpfw.iv, sd.kfz.161, zvezda by Thomas. Bookmark the permalink.